My lovely neighbour has some super lilies in tubs that live in her conservatory in Winter and go out into the garden in Summer. They are currently flowering, so she invited me to pop round to photograph them. There's something very beautiful about a lily - I think it's the way it folds open and reaches for the light and, of course, the fragrance is divine. Beautifully done, love the lighting. Gorgeous and it looks stunning on black. I love the lighting. fav. Love the light on this flower! FAV beautiful flower and gorgeous image. Lovely balance of light and shade - it looks great on black! 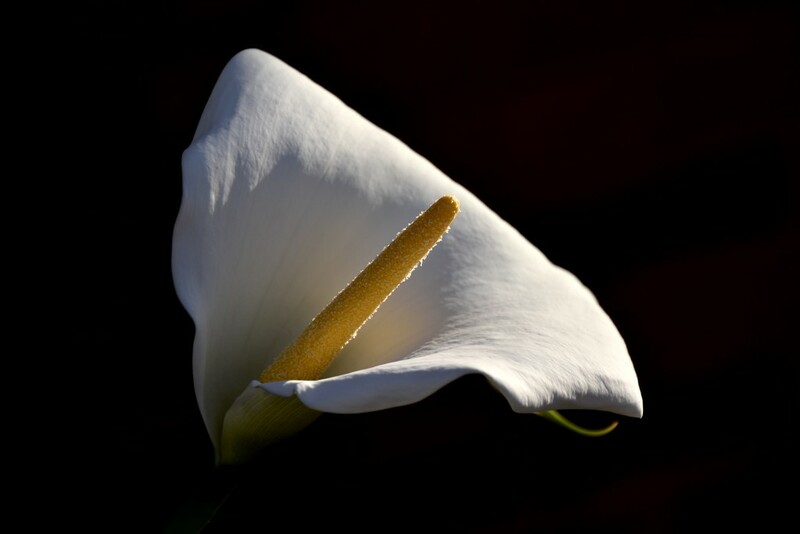 A beautiful close up capture of this nice Calla flower. Great lighting and background. Absolutely stellar lighting on this beauty-of-a-flower. Wow! A lovely arum lily and a great capture . This is stunning! I think your month of black and white clued you in to maximizing the light on this shot against the black background. Beautiful! Fabulous shot with wonderful lighting. A beauty....so lovely against the dark background! Gorgeous with the detail and the stark black background to set it off well. Gorgeous dramatic lighting and contrast! Fantastic light on those lilies.